One look at this gorgeous pine outdoor furniture and you'll be intent on enjoying lunch outside soon! The Amish Yellow Pine Traditional Picnic Table with Two Backed Benches is inviting and comfortable, with a yellow pine picnic table flanked by two pine benches. Lean back against the bench back and enjoy fresh air, food and fun with family outdoors! Set the scene in your garden, backyard or patio with this delightful outdoor furniture set. Built by the Amish with durable pine wood, your outdoor scene will offer a warm welcome. yellow pine wood is attractive-even more attractive? The price! For painted sets, we send free touch up paint just in case! We're committed to providing homes and businesses with the custom furniture they need. 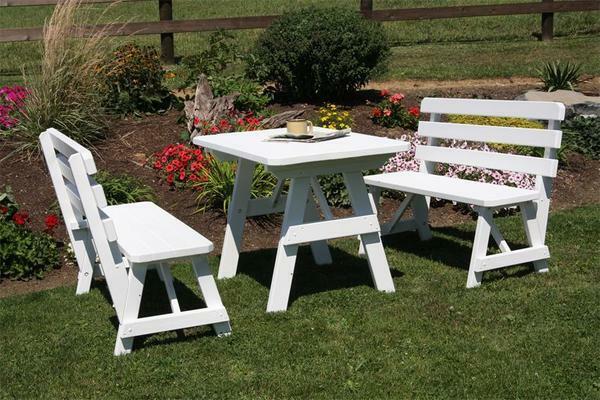 This pine set is ideal for a hotel, resort, campground or school in need of outdoor seating. Visit our Contract Sales Page today for more information on DutchCrafters solid wood furniture for business.